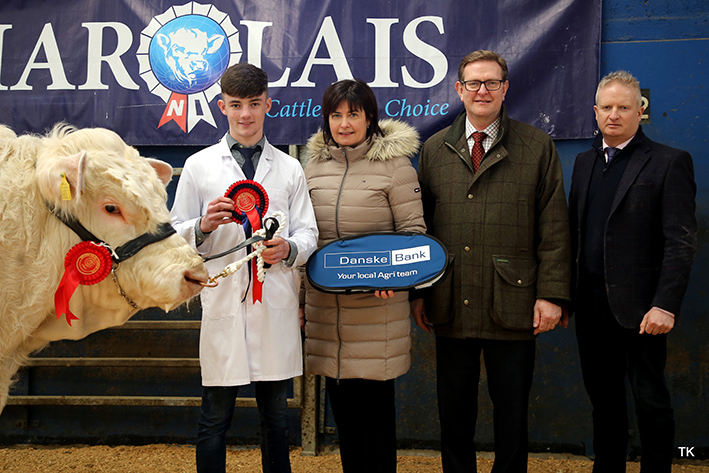 There was a good trade for the Charolais at Dungannon on Friday 15 March at the Northern Ireland club official spring sale sponsored by Danske Bank. Bidding peaked at 8,000gns and 33 lots sold to an average of £3,379, £94 up on last year’s sale. The sale topper at 8,000gns was the supreme champion from C & S McIlwaine, Newtownstewart, Co Tyrone, who also picked up the junior & male championship awards. 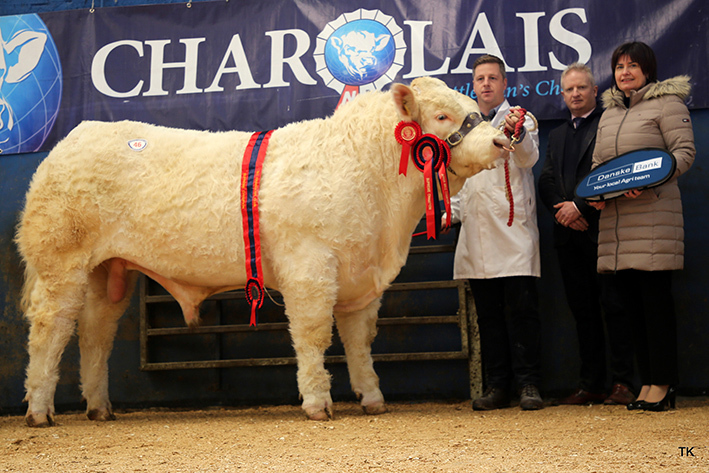 The November 2017-born Corrick Napoleon, a son of the 25,000gns Stirling intermediate champion Inverlochy Ferdie and Corrick Hazel, who goes back to 9,000gns Balmoral supreme champion Goldies Carnival, was the star of the sale and the man with the final bid and taking him home to Belleek, Co Down, was Terence McGarrigle. Next in the trade stakes was a 14 month-old entry from Andrew Wallace, Gubbacrock, Co Fermanagh, who was purchased by W Cousins, Omagh, Co Tyrone for 6,600gns. Newline Outstanding, a son of the 30,000gns Dingle Hofmeister and the Oldstone Egbert daughter Newline Ivy, was a class winner at the morning’s pre-sale show. Micheal O’Gorman’s senior champion Bromich Nevel from Mullaghbawn, Co Down, was the first of two to go under the hammer at 4,200gns. This June 2017-born lad is sired by Crossmolina Euro, bred out of the Blakestown Brion-sired Tullyallen Elaine and took the fancy of T Aiken, Coleraine, Co Derry. Matching the 4,200gns price tag when he was purchased by Messrs Boyd, Bushmills, Co Antrim, was the reserve supreme champion bull Derryharney Nipper who is a September 2017 born son of Doonally New and his dam Derryharney Lulu, a Clogher show junior heifer champion, is in turn sired by the Ballymena show champion Glenross Graham. He was bred and exhibited by Harold Stubbs and his grandson Alan Burleigh, Crummy, Co Fermanagh. Just behind at 4,100gns was another 14 month-old entry from the aforementioned Andrew Wallace who had been tapped out second in his class by show judge Nigel Matchett. Newline Oliver, who went home with S Taylor to Belfast is by Major and his dam is Ashleigh Hazel, a Pirate daughter. 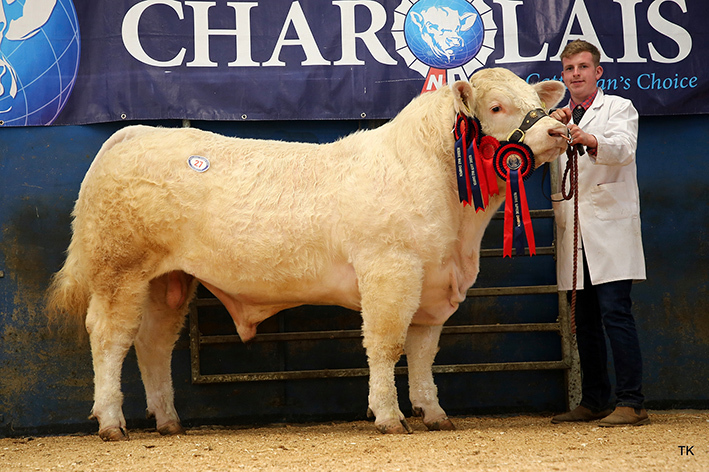 The very next lot was chapped down to RW Gourley, Cookstown, Co Tyrone, for 4,000gns. 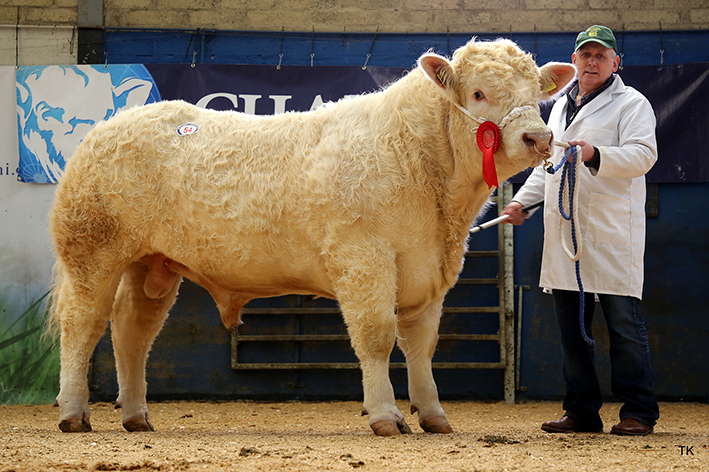 The January 2018-born Slievemore Oisin who boasts an impressive pedigree being by the 25,000gns Stirling intermediate champion Inverlochy Ferdie and out of Burnside Izra, a daughter of the 16,000gns Stirling junior champion Clyth Diplomat, was bred and exhibited by Seamus Bradley, Plumbridge, Co Tyrone. A pair of bulls sold for the next highest price of 3,800gns and the first was Brogher Nike, an October 2017-born, yellow ticket winning entry from Trevor Phair, Bellanaleck, Co Fermanagh. He was purchased by SA Britton. Dunamana, Co Tyrone, and the breeding here includes Blelack Blackberet on to the home-bred Brogher Fancygirl that goes back to Lyonsdemesne Tzar. The other to sell at the 3,800gns price tag was Woodpark Nugget, a son Deeside Gulliver who has bred over 90 progeny into Will Short’s Beragh-based herd since his purchased in 2013. His dam Maerdy Inbred is a Welsh-bred daughter of the French born Froufrous and the 15 month-old Nugget goes on to work in Belfast for new owner ED Sherrard, Belfast. Mr Short backed this up sale with another Deeside Gulliver son Woodpark Naples who made 3,500gns. C Monaghan, Cookstown, Co Tyrone, was the last man in on this May 2017-born bull whose dam is the home-bred Rumsden Tsar-sired Woodpark Evette. The first of two knocked down for 3,600gns was Drumconnis Neptune, a May 2017-born entry from John McGrath, Dromore, Co Tyrone. His dam is the 15,000gns Goldies Dynamite daughter Blelack Fern, he is sired by the 12,000gns Caylers Hustler and he was purchased by Sean Mullin, Cookstown, Co Tyrone. The other 3,600gns lot was entered for sale by Patrick Quigley, Bellanleck, Co Fermanagh and snapped up by Messrs Chesney, Kircubbin, Co Down. Rossavalley Navan, a November 2017-born lad whose sire is the 18,000gns Thrunton Fairfax, is out of Rossavalley Jill, a Blelack Digger daughter. Just behind at 3,500gns was Harold Stubbs and Alan Burleigh’s Derryharney Nelson, a 17 month-old out of the Thrunton Bonjovi daughter Derryharney Imlucky. The man behind the money on this 10,000gns Stirling junior champion Goldies Icon son was J Fraser, Belfast. Heading up the females which averaged £2484.30 for the three sold, was the reserve female champion Killadeas Natasha who fetched 3,000gns when she was knocked down sold to Stephen McGuiness, Greysteel, Co Derry. A 23 month-old heifer from Stuart & David Bothwell, Ballina Mallard, Co Fermanagh, she is out of Killadeas Gail who goes back to the 16,000gns Stirling supreme champion Blackford Dynamite and is sired by the Welsh bred Gwenog Braveheart. Averages 33 bulls £3,379, 3 heifers £2,484.